I’ve just finished creating a new website for a client and one of the first recommendations I made was to include a scheduler on her WordPress site. Acuity is easy to set up, even if you’re not a techy person, and you could have it set up within an hour. The dashboard is really intuitive; it’s split into 3 sections – your own appointment calendar (where you see any appointments that are booked), Client’s Scheduling Page (where you can get the links to share the scheduling page, embed it on your website & customise the appearance) and the Business Settings (where you set up your availability, any questions for the intake form, payment settings etc). 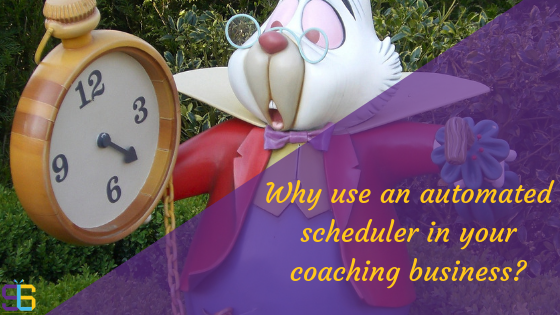 If you’re a start-up coach and don’t yet have a website set up, the Acuity scheduling page is actually a stand-alone page so all you need to do is share the link. For example, you can include the link in your email signature, use it in your email marketing, or your social media posts etc. It allows you to block out time you want to keep as unavailable e.g. if you’re travelling or know you have personal appointments booked, or have the half day booked for some “you” time (which we all know is important to keep yourself refreshed and focused). You can set up an intake form so you can get as much information from your (potential) client beforehand. The free version is great if you’re just starting out – it is very basic though, and if you want it to fully integrate with your current calendar (i.e. Google Calendar, Outlook etc.) then the next plan up would be best suited to you. At the moment that’s $15 a month. The paid version also sends out reminders to the client about the appointment and allows you to customise the page with your logo & colours so it feels more in line with your brand. It also allows you to set up the option of choosing a time zone – ideal if you’re trying to reach clients the other side of the world. Acuity also enables you to set up pricing so a client pays for the appointment when they book it. A great way of removing that headache of chasing clients for payment after the session has taken place. Not only is Acuity easy to use for yourself, it’s also a simple, seamless process for your client. They simply select when they want to meet/call you (from the times you’ve set up as being available) – they can even set up a recurring appointment if they wish – fill in their details + any questions you might have asked in the intake form, add the appointment to their own calendar, and they can set up an account if they like so they can see all the appointments they have with you. It’s also easy to reschedule appointments, and you both get an email notifying you of any changes to the appointment. If you’re interested in using Acuity for your coaching business, and want a bit of help setting it up please get in touch. ** Now, you may be thinking if I’m such a fan of this scheduling app then why don’t I use it myself? Good question! If I allocated set times to take calls, then believe me I would use this, however most of my daily work is really flexible and I tend to move things around a lot in order to accommodate my clients, so it wouldn’t really make sense for me to use it.